As Hindus all over the world celebrate Diwali or Deepavali, which signifies victory of good over evil, light over darkness, world leaders, including US President Barack Obama, Prime Minister Stephen Harper and The Vatican have sent wishes to everyone celebrating the festival. On the White House’s blog, President Barack Obama speaks on video about the significance of Diwali, as the festival of lights. He goes on to share stories of the first Diwali hosted in the White House in 2009, which he celebrated with family. "I want to wish a Happy Diwali to all those who are celebrating the festival of lights here in the United States and around the world. For Hindus, Jains, Sikhs and Buddhists, lighting the lamp—the diya—is a chance to remember, even in the midst of darkness, that light will ultimately prevail," he says. The Vatican or the office of Pope Francis, spiritual leader of the Catholic Church, has also released a message wishing Hindus around the world a "Happy Deepavali 2014." "As Hindus worldwide celebrate Deepavali or Diwali, the festival of lights, on October 23, the Vatican has called on Hindus, Christians, followers of other religions and people of good to foster together a culture of inclusion for a just and peaceful society," said the message from the Vatican's Pontifical Council for Interreligious Dialogue. The celebrations in India started yesterday. Prime Minister Narendra Modi spoke with Hindu priests in front of a display of donated sweets during the Hindu celebrations in Maha Annakut Festival during the second day of Diwali in Ahmadabad, India. Widows (Right photo) abandoned by the their families are caught on camera praying at the bank of River Yamuna, organized by NGO Sulabh International in the Northern Indian State of Uttar Pradesh. Singapore, the nation-Island city, has an immense Indian population and holds celebrations in the flourishing 'Little India' district. Fireworks are banned but sparklers are allowed so that everyone can partake in the celebrations. Japan hosts a small community of Indians but it doesn't mean that their Diwali celebrations aren’t larger than life. An annual event is celebrated in Yokohama at the Yamashita Park, where all the aspects of Indian culture is celebrated – including fireworks. 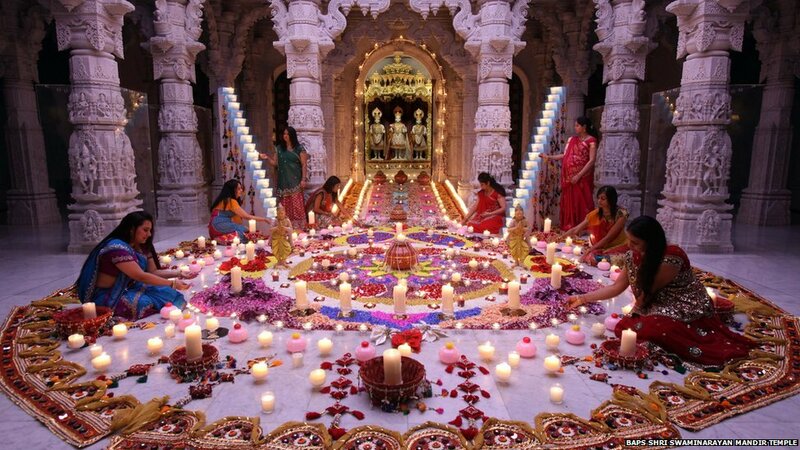 Diwali celebrations in Thailand are called Lam Kriyongh. Lamps made of banana leaves are lit and then sent floating on the river. They are emblematic of prayer of strength during uncertain and difficult times. The celebrations in Malaysia are similar to the ones in India with fireworks glowing in the sky. There is also a puppet show, which takes place enacting the Indian myth of Ramayana, to remind younger generations of Diwali’s significance. Known as Tihar, Diwali is celebrated for five years. Each day is dedicated to an element of nature or an animal. The fourth day is dedicated to death although it continues to be a celebratory affair. Don't forget to share your pictures with us at Anokhi_Media and show us how you've been celebrating Diwali.